For tourists, there are three main options going to and from Narita airport. You can either take the airport limousine bus, or the trains from the Keisei line and the JR line. There is also the recently added budget bus lines, Tokyo Shuttle Express bus and Access Narita bus. This bus can take you directly from the airport terminal to your hotel and from your hotel to the airport. Check if your hotel is on the list of destinations and be aware that it could stop at many other hotels first, so don't assume that you can just sleep in the bus and automatically end up at your hotel. You can also choose to be dropped off at the Shinjuku station and the Tokyo station. Although the name limousine bus sounds very luxurious, it is just a relatively normal tour bus with slightly thinker seat cushions. I have taken the airport limousine bus before from Haneda airport to the Hilton Tokyo hotel and out of experience, I would not really pick this option if there is a choice. I usually already feel very bad after a long flight of 11 hours and another hour or two in a shaky bus is not really nice. When it is hot outside, the long bus ride can get uncomfortable with the sun shining in your eyes. There are thin curtains in front of the windows that you can close, but the warm rays that still get on your skin and the warm stuffy air in the bus can make you nauseous. This might be better during the colder months though, as I went during the summer. Special fare: 2,000 yen for youth (age of 12-25) and Senior (65+). Travel time to Shinjuku: about 95-125 min. For more information, you can have a look at the official website or the Facebook page for special limited time deals. You can find and print out/save the maps of where the ticket counters and bus stops are located beforehand. The time tables of when a bus departs can also be found there. You can now buy a "Return voucher" at the Airport Limousine Bus ticket counter at the Narita airport. The price is 4,500 yen for adults and 2,250 yen for children. Note: the price of a Tokyo Subway 1-day ticket (not to be confused with the Tokyo Metro Pass, which only covers the Tokyo Metro lines and not also the Toei Subway lines) costs 800 yen (adult) and 400 yen (child). For a 2-day ticket, you pay 1,200 yen (adult) and 600 yen (child) and for a 3-day ticket, you pay 1,500 yen (adult) and 750 yen (child). These are special tickets sold to overseas visitors on tourist visas only, available at the Narita and Haneda airport. More information can be found on the Tokyo Metro website. So, the package deals are only great value, when you cannot get the return vouchers and need to pay the full price (adult). Or when you forgot to buy the Tokyo Subway tickets at the airport. I would only take the airport limousine bus, when you are in Japan for the first time and you do not know much about the train system in Japan as the other 2 train options might require you to transfer to the normal (metro) trains to get to your hotel. Also, the fare is more reasonable going to and from Haneda airport instead, so if you can choose the airport while buying the airplane tickets, pick Haneda. The fare will then be 1,200 yen for adults and 600 yen for children. The travel time in the bus is also a lot less since Narita is located farther away than Haneda (only 45-70 min. to get to Shinjuku). Taking the train is the most comfortable, so I would definitely recommend taking the train. There are two competing railway companies for this track between Narita airport and inner Tokyo. 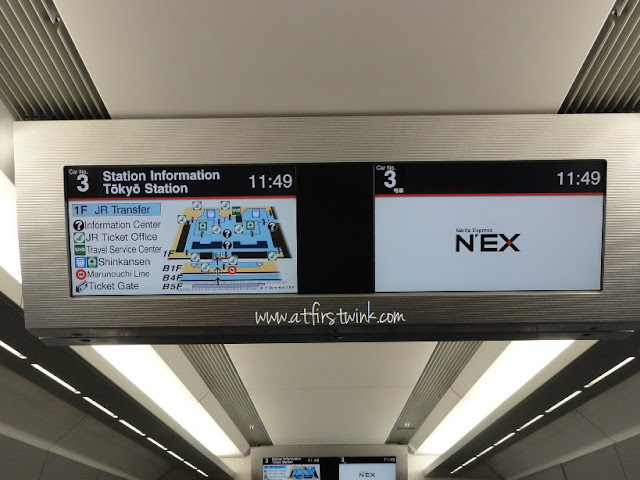 Fares to Ueno (one-way) : taking the Skyliner with reserved seats and arriving in 41 min. (2,470 yen), taking the Narita Sky Access (1,200 yen), and taking the Keisei main line train (1,000 yen). Special offer: You can get a small discount by ordering the Skyliner e-tickets. Travel time directly to: Ueno (41 min. ), Asakusa (51 min. ), and Higashi-ginza (62 min.). For more information on total fares, other stations, and which station to transfer, click here. The Narita Sky Access and the Keisei main line train are normal commuter trains, so it can get very crowded and it takes a longer time to reach your destination due to the many stops. It is however easy to get a seat when you are departing from Narita airport as it will be the first stop, but getting on the train from a normal station to the airport can be more difficult as there will not be that many empty seats and it will be more crowded. The Skyliner is Keisei's newest train with increased speed, reserved comfortable seats, and spacious interior. This explains the higher fare. I have never taken the trains on the Keisei line before, so I cannot give my opinion on this option. 3. My preference: the N'EX train on the JR line. Travel time: 53 minutes to Tokyo station. Now that I have become familiar with the myriad of train lines in Tokyo, I always take the N'EX (Narita Express) train. The Suica & N'EX deal especially for tourists is too good to pass. It is a package including a round-trip ticket for the Narita Express train between Narita Airport and any station in the Tokyo/Yokohama area and also a 1,500 yen preloaded Suica smart card, which can be used for about 4 days of traveling on the metro trains. Minus the 1,500 yen loaded on your Suica card, a one way trip on the train would only cost 2,000 yen. Although the "ordinary car" category might sound bad, it is a very luxurious train with broad seats and a lot of space to store your luggage. It is comparable to the Keisei Skyliner train, which costs 2,400 yen to get to Ueno only. You also get reserved seating, so you are sure that you get a place to sit and that you are sitting next to your friends and family. The N'EX train has always been peaceful and quite empty, the five times that I have taken it. Great to relax after a long flight or to be less stressed before your flight back home. They have changed the deal to a N'EX Tokyo Direct Ticket (one-way, ordinary cars, and reserved seating) for 1,500 yen. Please note that this offer is not valid for travel from the Tokyo area to Narita airport. You will have to pay the regular fare to go back, which costs at least 3,020 yen (departing from Tokyo station). You can find more information on the JR-East website. From the Keisei Bus Ticket counter at Narita airport, you can buy tickets for the Tokyo Shuttle Express bus, which stops at Ginza (Yurakucho), Tokyo station, Shinonomeshako, and Oedo Onsen Monogatari. This is a very affordable option, but it has a limited amount of destinations. However, most places can easily be reached with the metro trains from Tokyo station. Travel time: It takes about 70 minutes to reach Ginza and Tokyo station. The Access Narita bus is a bus that only has the route Narita airport <-> Ginza station and Tokyo station. You don't have to get tickets at any counter and you can just pay in cash on board on the bus. It is also first come, first serve, so be sure to get to the bus stop well ahead of time. You can now use this useful Narita airport access planner to find the times that the trains and buses leave from Narita airport station, matching the time that you arrive at the airport. You might also be interested in reading my post about what there is to do at Narita airport. Not only is it cheaper and faster to travel from and to Haneda airport, but you can also take the cool Tokyo Monorail. Fare (one way) : 490 yen ( for a paper ticket from Haneda airport to Monorail Hamamatsucho Station) and 483 yen (when you use a IC card (any electronic travel card from Japan). Children get a 50% discount (rounded up). Special offer: Monorail and Yamanote Line discount ticket for 500 yen. With this ticket, you can travel from Haneda airport to any station on the Yamanote metro line (most of the well-known metro stations/touristy places, where hotels are located). This offer is only valid on weekends, holidays and other select dates. You can buy this at the Tokyo Monorail ticket machine at the airport.